Storyline: A reporter who has had an affair with the daughter of the U.S. President is sent to Hungary. There he is bitten by a werewolf, and then gets transferred back to Washington, where he gets a job as press assistant to the President. Then bodies start turning up in D.C.
For the time being at least, it would appear that the ‘werewolf’ movie was a popular (and accepted) genre and Werewolf of Washington was certainly worth the price of admission. Former child star and Quantum Leap regular Dean Stockwell headed the cast, whom created a decidedly odd blend of horror and political satire from Ginsberg – who also wrote the screenplay. Stockwell plays Jack Whittier, a press secretary for the White House who, after an affair with the President’s daughter, is shipped off to Hungary. Whilst there, Jack is bitten by a werewolf and this is where the fun starts… Upon his return to the U.S., and bringing the ‘Curse of the Lycanthrope’ back with him, Jack struggles to balance his duties as a politician with his affliction of having become a werewolf. Featuring a series of outrageous mishaps which befall poor Jack, whilst the political satire and his rants about the Pentagram (directly referencing the Pentagon) are only mildly amusing at best. 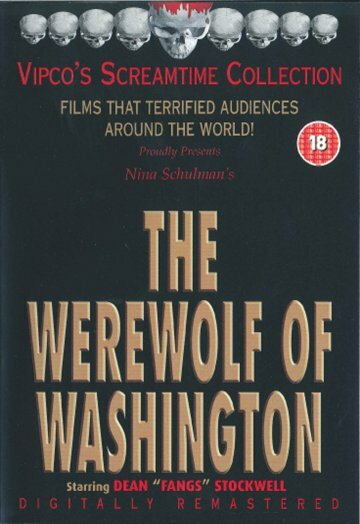 Strangely, Werewolf of Washington shares a great deal, including similarities in its soundtracks, with Stan Dragoti’s hilarious vampire spoof ‘Love at first bite’, which starred the permanently tanned George Hamilton. Whilst addressing the rise in speculation about whether Ginsberg’s film was actually intended as a comedy, anyone in any doubt should check the scene at the bowling alley which shows the President (played by Broadway star William “Biff” McGuire) and Jack hopping down the aisles, which could so easily have been lifted directly from a Mel Brookes movie! Giving more than a passing nod to 1941’s The Wolfman, which starred starring the legendary Lon Chaney, Werewolf of Washington borrowed several elements from this classic horror from Universal. There is little doubt however that the film’s primary source material was pulled directly out of the Nixon administration; though modern audiences in the UK might find themselves a little confused however, as his tenure as president is hardly required reading in UK schools, rendering much of its political humour lost upon UK audiences. Werewolf of Washington was issued on tape by VIPCO during November 1981, which was precisely when US viewers were being offered the film on television, forming part of Cassandra Peterson’s (best known to her fans as Elvira – “The Mistress of the Dark”) popular ‘Movie Macabre’ series. 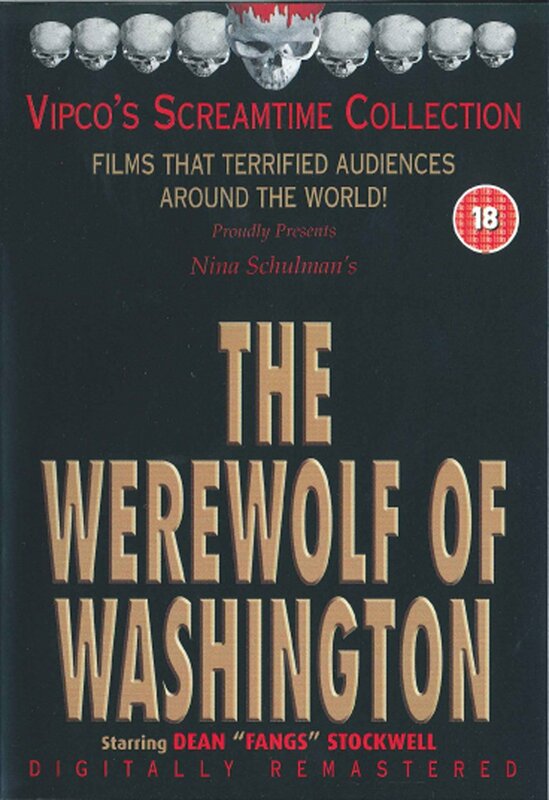 Viewers in the UK would have to wait until October 1984, likely when VIPCO’s 3-year license deal had expired, for Channel Four to screen this farcical Werewolf tale over here on network television. The film would reappear on VIPCO’s resurrected label under the company’s “Screamtime Collection”, minus its menacingly werewolf-orientated artwork of course. This release wielded a ‘15’ certificate, although one wonders how they arrived at such a rating as there is very little here to induce anything beyond that of a ‘PG’. That said, our censors are not widely known for their logic! Around the same time as VIPCO’s digital re-release, Ginsberg’s film reappeared Stateside on Shout Factory Theatre’s “Elvira’s Movie Macabre” series, double-billed with Barry Hope’s ill-fated Doomsday Machine – another Elvira-hosted offering, this time from August 1983 – which featured Scooby-Doo voice-over star Casey Kasem.